Former Arkansas Gov. Mike Huckabee, the latest Republican to jump into the 2016 presidential race, took to Texas' oil capital Monday to flesh out his energy plan. HOUSTON — Former Arkansas Gov. Mike Huckabee, the latest Republican to jump into the 2016 presidential race, took to Texas' oil capital Monday to flesh out his plan for making the United States less dependent on foreign sources of energy. Huckabee laid out an eight-point strategy that he said could "completely transform the balance of world power," including lifting the United States' 40-year ban on crude-oil exports and ending what critics see as a similar, de facto prohibition on natural-gas exports. He also called for a stronger embrace of alternative sources of energy such as solar and wind power. "We need to be a country that looks at the world and realizes energy is the backbone of making this world function, and we start talking about what we can do rather than what we can't do," Huckabee told a lunchtime crowd in a downtown building with panoramic views of the Houston skyline. The proposals, Huckabee said, would move America away from an "energy-dependent culture" that threatens national security as the United States deals with oil-rich nations that do not always have its best interests at heart. The speech to the Houston Club — atop a skyscraper named after Shell Oil — was among Huckabee's first forays into policy since announcing his candidacy last week. In addition to scrapping the export bans, Huckabee called for giving local and state governments more control over energy policy — as opposed to federal officials who "wouldn't know an oil field from a golf course if they saw one," Huckabee said. That entails moving the "regulations back to the people closest to the industries," he added. That issue has flared up at the Texas Capitol, where lawmakers are debating whether to take away the ability of cities and towns to ban fracking after Denton did so last year. On alternative sources of energy, Huckabee said they should supplement greater use of the resources the country already has. He added that Americans "shouldn't demonize renewable fuels," hinting at a debate that is raging in early-voting Iowa, where Republicans are divided on the Renewable Fuel Standard central to the state's farm economy. Huckabee also called for opening more federal lands to exploration, getting rid of burdensome regulations at the federal level, using energy as a "bargaining chip" on the world stage and modernizing the electric grid. Currently, he said the American power grid is vulnerable to an attack that could leave citizens "living the life of Fred and Wilma Flintstone" within minutes. Huckabee cast doubt on claims that growing the oil industry would hurt the U.S. environment, saying the United States already produces the cleanest forms of energy in the world. If America shies away from energy exploration, countries with far worse track records on pollution will happily fill the void, he suggested. "Do you think for a moment they're doing it with a real consciousness for how clean it is?" Huckabee asked, using China, Iran and Russia as examples. The low-key speech mostly steered clear of politics except for a handful of references to President Obama. Huckabee dinged Obama for delaying a decision on whether to approve the construction of the Keystone XL pipeline, which "ought to be one of the easiest pieces of low-hanging fruit the president could pick up on." And Huckabee reiterated his opposition to the Trans-Pacific Partnership free-trade agreement Obama wants to fast-track in Congress, saying it "looks like once again our trading partners would get the better end of the deal." 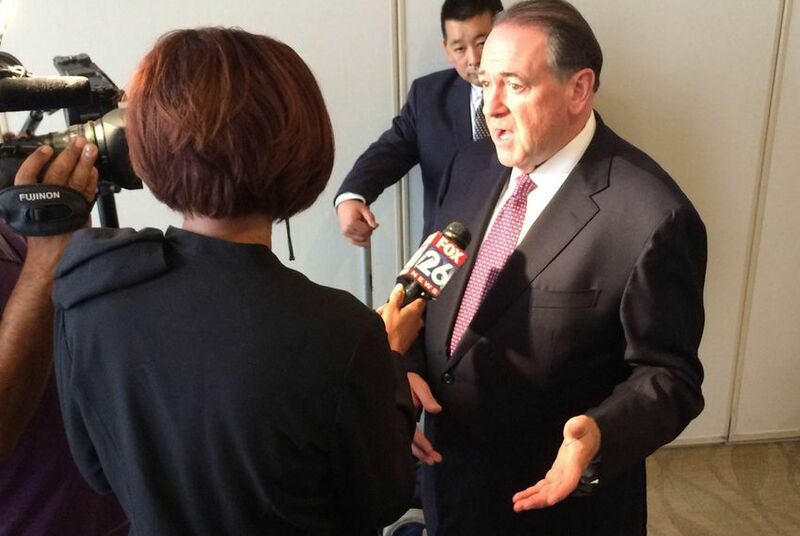 Huckabee's speech came as he kicked off a 17-city fundraising tour in Houston. He was scheduled to raise money later Monday in Austin and Tuesday in Dallas. He is set to return to Texas on May 28 for a fundraiser in Amarillo.